Happy New Year my Friends~ ★! The best wishes for all of you in this 2015, let’s work hard to achieve all of our goals and dreams! Today I’ll make a small recap about the 2014 achievements, 2015 goals and also I’ll give you, my dear readers, a small gift for this 2015. I began blogging with a schedule in order to be consistent updating once or twice every week. Re-opened my Etsy shop, made a simple business plan and finally found my target market. Took several online conferences (mainly on Alt), webinars and eCourses; I learned a lot about networking, marketing, business and blogging. I began setting monthly goals which helped me a lot with my organization. Found the motivation I needed to keep working hard for my brand/blog. Little by little I started making some online presence. Thanks to this networking I was able to interact with the bloggers who I admire and also met new wonderful bloggers who inspire and motivate me to keep moving on ♥. If you’re not in the subscribers list don’t worry my friend; you can easily subscribe just by typing your name and email address HERE (I promise I won’t spam) and you’ll get an email with the PDF tutorial~. Also you’ll keep getting blog updates directly in your inbox and special offers, advice, discounts and gifts I’ll give throughout the year only to my lovely subscribers ♥. Keep following my working and blogging schedule to be organized. Create and follow an expenses plan. Improve or re-design KooriStyle's blog layout. Focus 100% into my new target market. Google Analytics: Have 1K+ pageviews on a month and try to maintain that statistic. Be consistent in create new products for my Etsy shop. Learn more techniques for making doll items. Rent and use a PO box. Adapt room with shelves for better craft organization. Learn and try more cosplay techniques. Be healthier (eat better, drink more water, make some exercise like talking walks…). Backup PC data in external HD. Practice a lot my English pronunciation. 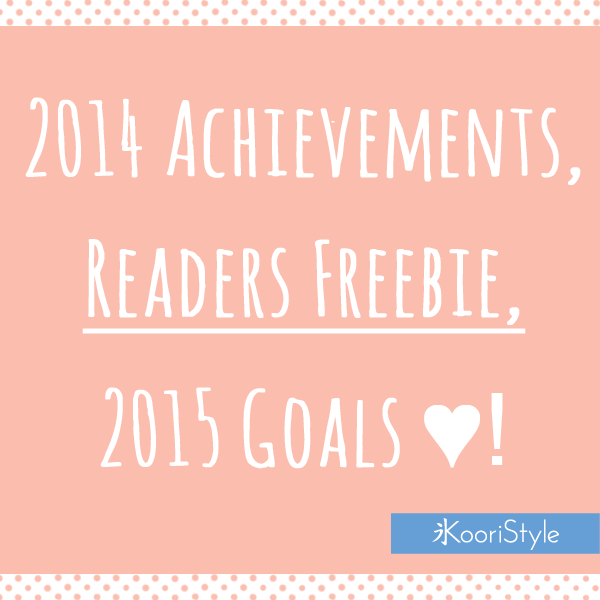 Do you have a special goal for this 2015? I’d love to read your comments below and, once again, Happy New Year my friends ♥!